I am often asked what will happen to our company in the near and far future. Here is an honest answer: I don’t know. But I have an idea about where we are going and how we should get there, so it would be strange to not share this publicly. Below, you will find many concrete solutions for some rather abstract problems. These are of course my personal thoughts, which obviously not everyone will share. I am personally attracted to the idea of washing away the boundaries between work and other activities. At work, people must not only work, but also learn and get inspired. A company should be designed to support and stay in touch with the fundamental values which were put forth at its foundation. At Targetprocess, we’ve been focusing more on learning and work lately; significantly less effort has been put into entertainment and inspiration. It is typically thought that people must learn by themselves. This is certainly true to a degree, but your company can help you. You have to keep on learning your entire life, without stopping. It’s easy to reach some heights and say to yourself “I already know quite a lot, so now l can switch to watching reality TV and keep working on the known track.” This is how you set on the path to STB (Sofa, TV, Beer in the evening). This is how dreams are killed. Run internal conferences where team members present to each other. Encourage your colleagues to present at public events and universities. Allocate time to allow them to do that. In general, a company can do a lot to enable learning. Long-term collaboration is of mutual benefit to both employees and the company. Learning is a vital part of advancing such collaboration. It’s very difficult to inspire people. Maybe this is the most difficult thing for every leader. It’s also hard for a leader to know if she is good at inspiring others. I personally think I cannot do it well. Moreover, the exact moment or cause of inspiration can be quite vague and hard to identify. For example, you can go to Rome to visit the Sistine Chapel, and not feel anything. Then, three months later, you’re back home sitting on your balcony with a cup of coffee and watching the city. You take your last sip and suddenly decide to change your life. It may well be that your visit to Rome influenced this moment, but you’ll never know for sure. Trust: trust is much harder than you might think, but people are incredible! A company must create opportunities and help its people to find something that gives them a kick or a sense of purpose. If a programmer decides they want to become an artist instead, let them go for it. It may be that instead of a mediocre programmer, the world will get a talented painter. Why does trust lead to inspiration? More often than not, people don’t realize what their true capabilities are. There could be a lot of reasons for this: psychological trauma in childhood, inattentive parents (or helicopter parents who were too involved), an incompetent education system, disinterested teachers, managers at work that strive to control your every step, and a thousand other possibilities. As a result, people are often afraid to try new things and make mistakes, so they bury their initiative and their own potential with it. A culture of trust in your company will slowly return a person’s trust in themselves, encouraging them to experiment and make mistakes. A culture of trust can help you to grow not only as a worker, but also as a person. With time, people will be able open up and find new sources of inspiration. encourage and support people’s hobbies and interests. Organize interest groups (drawing, sports, whatever) to aid trust and team-building. In an ideal company, a person can do whatever he or she wants without any control from management. The main idea is to bring people who like to work together towards a common goal. Now, it’s practically impossible to get 100+ people together with one common goal, but it’s important that there is at least a critical mass of such people in the company. I would say that 20-30% is enough. The rest of the company will ideally be inspired by this core group of dedicated individuals. Creation of a trust culture and mechanisms for decision making. Let’s take a developer from our company and imagine that nobody tells her or him what to do. How would she go about making decisions on what tasks to do next, on which problems are more critical for our customers and which are less critical? Suddenly granting this developer freedom of choice won’t lead to any good consequences. She or he needs to dive into the domain of project management, figure out what different processes (like Scrum, Kanban, and SAFe) are about, understand the current deficiencies in Targetprocess product, study customer requests, review similar products, understand trends and the current state of the market, etc. Without a solid background in the domain, you can’t expect this developer to be able to make good decisions with their freedom of choice, even if they are a responsible person. Freedom of task selection in the context of domain ignorance is just harmful. One must also understand that many developers consciously don’t want to understand the domain. They are interested in solving particular technical problems, not figuring out the subtle trends and details of project management. So, how can we go about giving this developer freedom of choice while still ensuring they have a solid context for their decisions? This is the hard question to answer, our try is below in Size and Structure section. Stage 1. Cancel time tracking, allow more flexible working hours, eliminate or reduce the amount of overtime and deadlines, don’t keep meticulous track of sick leaves, encourage employee participation in task selection. Stage 2. Free working schedule, free holiday schedule, possibility to work remotely from any location, full freedom in task selection. Our company is currently somewhere between stage 1 and 2. It is now vital for us to increase the critical mass of people who know the domain very well, in order to be able to move to stage 2. In my opinion, we are not yet ready for that move, but we’re getting there. Freedom imposes responsibility and demands a good understanding of context. So far, there still are significant barriers in people’s heads, which prevent companies from changing basic principles and models of governing. Control and authoritarian style still prevail. One must like what they do. A person must be able to work with pleasure, interchanging tasks that are on the edge of one’s capabilities with simpler and more routine work. The company must do everything possible to ensure that the employee’s interests fit with the company’s goals. If this isn’t possible, there are two ways out: part ways with this person, or let her/him start something new. Work must be fairly remunerated. What does that mean? On the one hand, it makes no sense for a company to overpay an employee, especially if the market offers a specific salary level for their skills. On the other hand, the company wants to eliminate any thoughts about looking for additional income sources. Therefore, salary must in general be slightly higher than what the market offers, and there must be a mechanism of revenue distribution among all employees. Career growth must not be linked to one’s salary. If a company has no hierarchy, a person can develop their skills into a new sphere of responsibilities with better productivity and more expertise. These are the criteria that need to be taken into account for evaluation. If all these conditions are met, a person will work quite well. But from time to time everyone can lose their motivation. I believe this can happen to anyone, without exception. This is where the need for inspiration comes in. If you get bored, go to an interesting conference and come back with interesting ideas. If this doesn’t work, maybe go to Australia for 2 months, and you’ll come back with a drive to improve everything around you. And if after that trip, you decide to change your life and start your own business, or change up your preferred work activities — this is wonderful. In our own company, I don’t believe that we excel with inspiration practices just yet. Some people are trapped in the routine of their comfortable habits and are just going with the flow (or worse, perhaps they have stagnated in still waters). This is something that we must fix. I believe that through strict control, one can achieve a significant increase in productivity, but at too high a cost. In the long run, this turns the company into a place where there is only work, which consumes one’s life and then throws them out into retirement, without giving the employee anything of value in exchange. A company must have harmony in order to allow people to live an interesting life, reach their professional heights, and fill their life existence with purpose. Currently, our company has 110 people. We want to create a great platform for work management, and for that we need at least 200-300 people. The goal dictates the size. Further growth to 1000+ people is possible too; if the platform excels, we can build on its basis and create different solutions for various fields. Company growth inevitably demands some structural changes. What we have here? Every blue dot is an employee. We see the whole company as a blue cell and our three different products/projects as green cells. As you see, TP product is the largest one, while BTS and VD are small products. Head (includes CEO and other top-managers). Makes decisions about budgets, new products/services approval. Product Owner inside a product (on the image above we have three products and three Product Owners). The person who initiated the product and invented it. He makes all final decisions about product strategy and vision, but this person doesn't have a power to dictate details to the teams. Technical Owner inside a product. A person who makes final decision about technical strategy. Source. A person who starts an Initiative inside a product. He is fully responsible for the Initiative's success and can make all decisions about the Initiative. He can accept or reject people that want to join the Initiative, make functional decisions, technical decisions, etc. Helper. A person who joins an Initiative. We got the Source and Helper idea from Peter Koening. It resonates with us and sounds like a valid theory about how people work. Every human initiative – from projects to parties to entire businesses – starts with one single founder, the source. The source is the person who takes the first risk to realize an idea. People are free to join Initiatives at anytime and leave Initiatives at anytime. Initiative approval creates an undesirable bottleneck in the system. If initiatives are quite large (1-3 months) and there are no more than 10 initiatives starting each month, then it is quite OK. However, this process does not scale. I think with time, when there will be more widespread understanding of our product's context, this gate will go away. Interesting fact: based on the first five months, all Initiatives were approved, so maybe we added unnecessary safety here. Lately, we have been seeing more and more attempts to create companies without managers. The main question is: why do it? Well, the answer is rather simple: if a company without managers can work at least as successfully as a company with a conventional hierarchy, you can have 20-30% less staff but still make the same great stuff as before. A second answer can be attributed to who is responsible for your work. In a traditional hierarchy, managers are loaded with most of the responsibility. From an employee’s perspective, it’s the managers who are to blame if I have to work 60 hours a week. It’s also their fault if my salary doesn’t grow. It's their responsibility if the company performs quite badly in general. However, when all this responsibility is transferred onto the employees themselves, it becomes more difficult to move their problems to others; they are now free to take responsibility for their problems. Hiring. Company Head decides about growth. Interviews with developers must be made by developers, so no managers are required. In fact, this is an easy process to delegate to the employees. Firing. Firing people is a more difficult task. 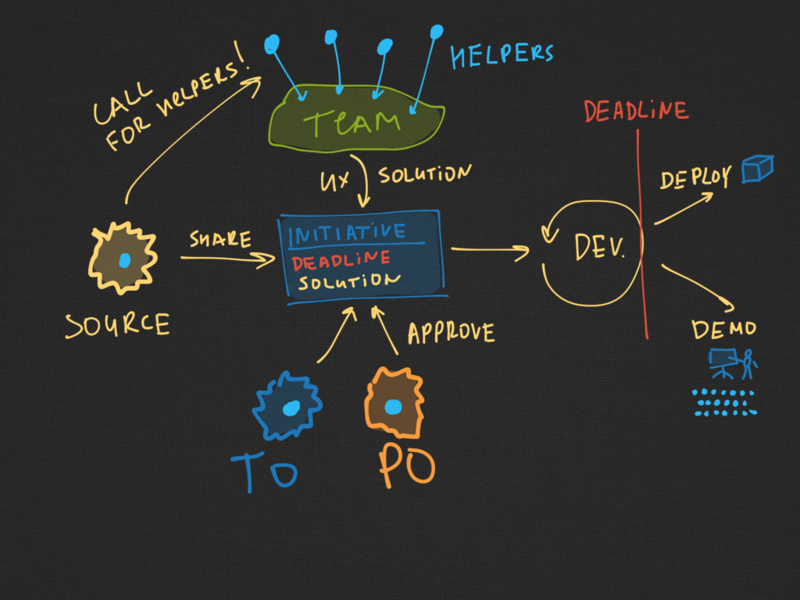 What could help here is peer review and team retrospectives. Unfortunately, firing someone is always a painful and hard process. I don’t think I know a good solution for it yet. Salary. I believe that a company must have profit sharing and transparent mechanisms for setting salary level. There are the examples of Buffer and FogCreek, where salaries are transparent and known to all employees. It’s hard to say how well this would work in the cultural context of our company, but in general I believe there must be unification and transparency. If these values are practiced consistently, process can replace a manager’s individual decisions. Conflict resolution. This is probably the most difficult thing for a team. It may be hard to resolve a conflict when people all have equal rights and nobody can have the last word. In our company, this is has been left to managers so far. In general, I believe retrospectives can work well here. If things get really bad, you can consider bringing in external help. Regardless, there are plenty of examples of companies where employees resolve conflicts without managers. Mentoring. This segment of management tasks is easy to replace: experienced colleagues can often be great mentors. There might be some individuals who aren’t, but normally there are at least a few such people around. Generally, a developer’s mentor should be a more experienced developer. Process improvement. In general, employees must themselves improve their own processes. In the first stages, they may need help with methods and practices, but after some time, it all works itself out. Vision and strategy. Another difficult question. As I see it, normally one person has a vision, not a group of managers. Therefore, theoretically, a company might have just one person (the CEO or CTO) who creates a strategy for company development, and successfully convinces others that the strategy is good. This role can be taken over by a group of experts. 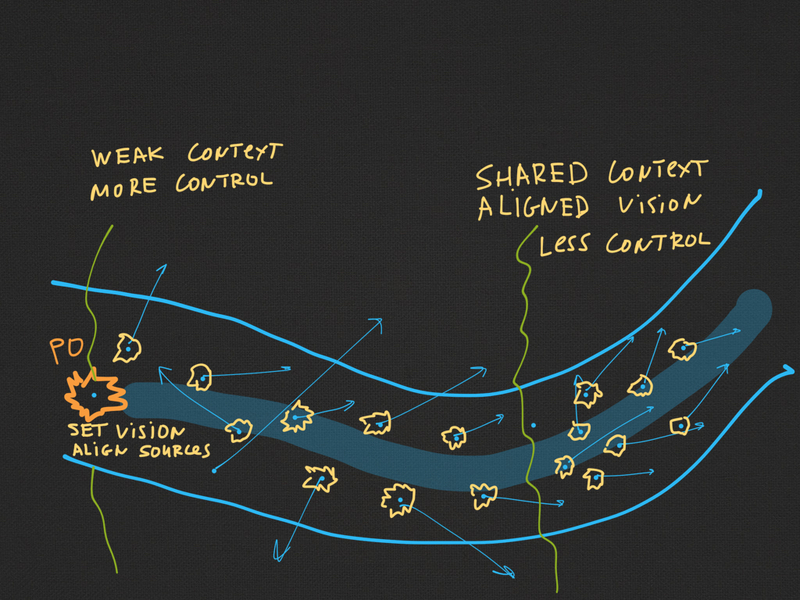 Another interesting question is: could a vision be formed in an emergent way? I think it could. This is how life evolved into the complex organisms of today. Why can’t a company follow this path? In a nutshell, the no-managers approach is too novel and many problems are left unresolved. My vision is that the percentage of managers will decline in the future, but the no-managers approach is not a goal a company should focus on. Does a company start with its people or its product? In the beginning, the product is probably where it all starts. People working for the company in its early days fully dedicate themselves to the company’s product. Gradually, the company grows and ideas about new products begin to emerge. At this stage, the importance of the company’s culture and people grows. Generally, a company’s culture forms itself not from the beginning but rather after a few years after the company’s founding. If one overlooks this important moment, then it may be very difficult to change anything in the fundamental principles of the company later on. I can hardly imagine how to change the culture in a company with 1000 people. This can lead to mass dismissals, serious loss of productivity, and even the death of the company. I think that our company has a good culture at its base. Maybe some of our new products have not yet taken off, but we know that with such a cool team, we can make awesome new products. This diagram shows the change of company focus over time and as it grows in staff. Obviously, the speed of such change may vary, but I believe that generally this picture is true. When a company has several hundred people and its core product has become quite mature, one should develop an ecosystem of internal startups to survive. My view is that over time a company turns into a framework, which supports innovation and stimulates the launch of new products by virtue of its financial capabilities. This way, one can cater for the long-term survival of the company and the spread of its culture to many different fields. It is also impossible to predict the direction in which this living thing will develop in 10 years.